My Verdict: 7.5/10. One time must watch. People with Romantic taste buds will definitely give higher rating. – BARFI action is heavely influenced by “Charlie Chaplin” acts. Also few of the comedy themes are directly taken from Chrlie Chaplin series. The set is heavily influenced by “Sawariya” movie, with lot of Blue & Black background. With some thrill of Bengali novel, adding emotional drawbacks of being dumb n deaf + romance angle + well direction, makes a superb movie to watch. – So it took: Acts from Charlie Chaplin & movie BLACK, some background of SAWARIYA, some Bengali novel thrill with seasoning of good direction in making of a sweet movie BARFI. – Ranbir Kapoor, as usual was 10/10 on acting. With diversity of roles already done, I am sure my conviction of him being next “Big B” will come true. – Priyanka Chopra & debutant Ileana D Cruz were also great. – It is very well directed movie by Anurag Basu. Although with lot of to n fro between past n present, all facts were well connected, very un-typical of a bollywood movie. 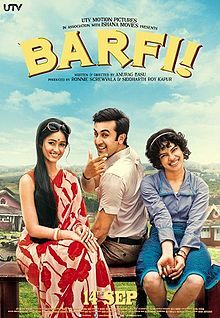 Most of the times in a thriller Bollywood movie, lot of gaps remains & facts remain unconnected, but BARFI certainly is an exception. – Movie beside borrowing from other inspirations, too has many Innovations: like very start address to audience of theatre, use of railway track & so on. Finally I saw Rockstar. Finally I saw the movie, whose I have been Idolizing the song, since the day I heard them. All the songs, each word & letter is so true. “Sada Haq”, “Nadan Parinde”, “Tum ho paas mere”……. wow, just hats off to lyricist. No wonder, they must have gone the real pain in real life to construct such impactful wordings (as also is the theme of the movie). Coming to movie, I felt, director, producer all lost an oppurtunity. An opportunity, which could have potentially made the movie biggest hit of the recent times. The underline story was just superb & infact connect to many lives in the society. Songs, Music of A R Rehman & acting of Ranbir Kapoor were the highlight. The downside was acting of Nargis, it was as horrible as her Anglo-Hindi ascent & somewhat illogical connectivity in the story line. It seemed that production was done in hurry. I think love should have been made natural, instead of getting an urge to have love. For me takeaway were the songs & the final lines : “Beyond the right doing, wrong doing, there is a world & we will meet there“. Also I think Ranbir Kapoor is potentially next Big B. Whatever, I still liked movie very much. My heart gives a rating of 9/10 but my brain gives rating of 6/10.